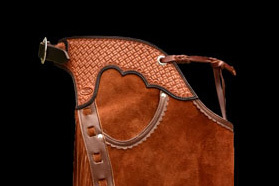 There are many different options to make your pair of Custom Joey Jemison Chaps unique to you. 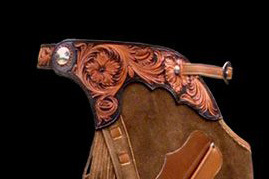 Choose the color, belt, tooling pattern, stripe, pocket(s), concho(s) and other details. Have your measurements taken to ensure a perfect fit. Back Belt: Can be tooled to match the belt and buckle in the front. If you prefer the buckle on the back of the chaps we use a 1" strap for the back belt and tie string in the front or buckle front. Your choice of no pockets, one pocket or two pockets. Conchos all the way down the stripe. Singel concho on the belt. Fringe options are single fringe or double fringe. Single fringe is cut from the same leather used to make the chaps with. Double fringe is a second layer of fringe sewn in behind the top fringe. Sometimes it is reversed to the slick side out to give a little contrast. 1. Waist: Measure around were the top of chaps will be worn, usually right below the actual waist. 2. Outseam: Measure from right below the waist to the floor. 3. Inseam: Measure from high into the crotch to the floor. When in doubt, measure long. 4. Thigh: Measure biggest part of thigh. 5. Middle Thigh: Measure around leg at point halfway between thigh and knee. 6. Lower Thigh: Measure right above the knee cap. 7. Calf: Measure biggest part below knee, usually above top of boot.